The other is a long short story. (That's what one calls a classical oxymoron.) Might get it done. Might not. It feels important to tell the character’s story even though that’s what she is –a fictional character. Being frugal is a strategy to have enough time and resources to do the Work That Is Ours to Do. Life is short. Yes, we have jobs and families, homes and communities. But there’s also the “This Is My Work” thing in most of us that NEEDS to knit a hat, write a poem, read to kids, make music, hike/bike half the day soaking up sunshine or rain and come back home feeling whole. When I worked with jail inmates, the ones who endured jail best and were the most successful at staying out once they got there … were guys who liked to cook, or make music, or work on engines, etc. Those guys had internal resources for when life was rough and unjust or maybe too just. I get like that about oatmeal. Most mornings I put 1/3 cup of old-fashioned oats in a bowl. Then add ½ to 1 cup of “additives” such as mushed sweet potato, baked squash, shredded or minced carrots, halved grapes, chopped rhubarb, as well as the more normal stuff like dried fruit, chopped nuts, berries. Then I add 2/3 cup water (or leftover juice) and microwave this slurry for 2-3 minutes. Take it out, add a half teaspoon of cinnamon, and eat my sliced apple sprinkled with turmeric (anti-inflammatory) while the oatmeal cools. Oatmeal is like the sunniest kid on the playground who will play with just about anyone. Oatmeal LIKEs to be leftovers' friend. 3. 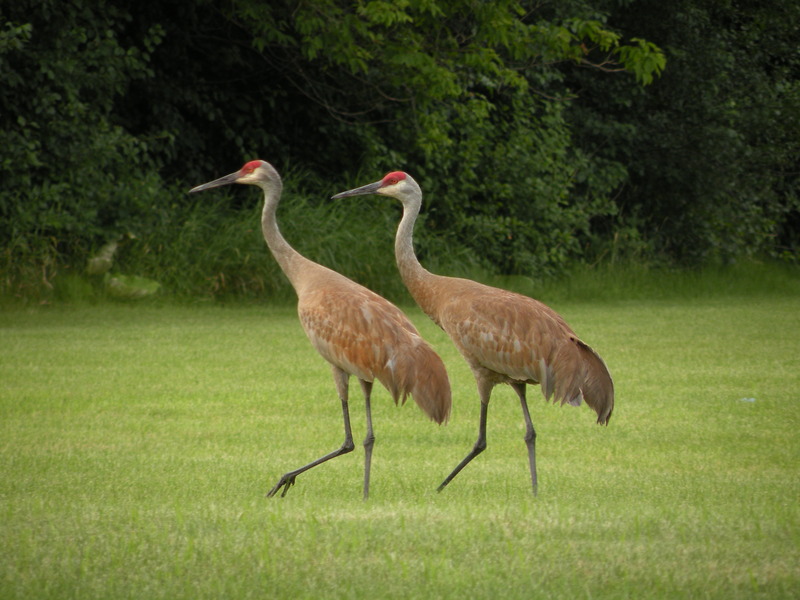 We’re going away for a few days to see the return-migrating Sandhill cranes in Nebraska. We’ve called the motel as well as the tour to the river flats - to make sure they are there in the midst of Nebraska's terrible flooding. They are. Says the woman who went on vacation with her family to a resort in Florida and ended up in a hurricane. 4. I bought two thrifted multi-pocketed duffle bags. We have (old but viable) suitcases, but they are either too big or too small. For a very small cash outlay we will see how these bags work. 5. We’ve wanted to see the massive Sandhills migration flocks for years. It’s frugal to strongly want things one can probably get. For the Great Wall of China and an African Safari, we watch documentaries from the sofa while drinking store brand seltzer water. 6. It’s 40 degrees out right now but very sunny. Our front porch, with its no-tech 1970’s windows, is so warm we have the front door open to let hot porch air come into the house. Solar power is amazing. All one has to do is find a south facing window and believe in it. Guess I know what u’ve been doing today. Oatmeal and cranes. A few of my favorite things. I’m in awe of Sandhill Cranes and look forward to hearing about it and seeing pix. The one above is gorgeous. Len took the photo of the cranes I used. I think it was from around Waukesha - when we lived in Racine but he worked in Waukesha. And yes, he is bringing the camera and tripod with on this trip. Taking photos at special places is like walking in fresh cement - you know you were there.